In 1985 Sam Torrance wept after he sank the putt that finished the Americans at The Belfry and once again, in 2002, his inspiration led Europe to glory. 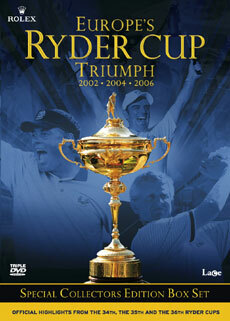 On one of the greatest days of the competitions glorious history, the Europeans won back the Ryder Cup. They left for America in 2004 as underdogs and returned as record-breaking heroes. Europe's Ryder Cup team led by Langer, marshalled by Montgomery and galvanised by Garcia were golfing heroes outclassing the might of America 18½ points to 9½. For noise, passion and emotion The 36th Ryder Cup, played for the first time in Ireland, was unmatched. Europe, with arguably their finest team performance ever, entered the history books by winning the Samuel Ryder Trophy for a third successive time.